The King County GIS Center Training Program conducted its latest weeklong GIS Academy October 8th–12th in its King Street Center training facility in downtown Seattle. The GIS Academy is a one-of-a-kind, hands-on educational experience that takes students through a realistic municipal GIS workflow simulation using actual data and standard GIS software. This custom academy was developed and is taught by KCGIS Center staff, who use the same technology and data in their everyday work, which adds to the authenticity of the tasks and solutions that the academy curriculum presents. The GIS Academy is a true regional service. In addition to King County employees, students at the October Academy included staff from the cities of Seattle, Bothell, and Kirkland, from Thurston County and the State of Washington, and one unaffiliated GIS practitioner. The Academy is also an approved training program for the Washington State Department of Personnel, it is approved for Veterans’ GI Bill Benefits, and the Academy classes are eligible for educational achievement points awarded by the GIS Certification Institute. For more information about the GIS Academy and the entire King County GIS Training Program, see the Training Program home page at www.kingcounty.gov/gis/training. And look for 2013 Academy sessions in April (1st–5th) and October (7th–11th). Greg Babinski, KCGIS Center Finance and Marketing Manager, has received the 2012 Summit Award for GIS Person of the Year from the Washington State Chapter of the Urban and Regional Information Systems Association (WAURISA). The honor was announced during the opening ceremonies of the 2012 Washington GIS Conference in Tacoma on May 8th. Tom Nolan, City of Seattle IT Manager and the WAURISA 2011 Summit Award honoree, presented this year's award to Greg. In doing so he highlighted Greg’s experience, commitment, service, and leadership in the Washington GIS community. WAURISA summarizes its criteria for the award by noting that the recipient should be someone who has “has changed the Geospatial Information profession in some significant way,” and Nolan affirmed the numerous ways that Greg fulfills this qualification and all of the specific criteria that the award represents. Greg Babinski, a graduate of Wayne State University, brought his experience in mapping and GIS management to the King County GIS Center in 1998. Among many past and present professional affiliations and leadership roles, Greg is the current president of URISA. Congratulations Greg! Twenty years ago, geographic information services were in the proposal and planning stage in King County, Washington. Today King County’s geographic information system (GIS) includes integrated spatial databases, mapping and analysis software, information technology, and professional GIS staff. King County’s GIS was developed to meet the business needs of county users, and it also provides free data and online mapping capability to the public. In March 2012 a return-on-investment (ROI) report issued by Professor Richard Zerbe and Associates showed that use of the King County Geographic Information System has resulted in at least $775 million in net benefits to the county over the eighteen-year period from 1992 to 2010. While ROI estimates are often developed as part of a proposal to develop a geographic information system, it is believed that this is the first study by independent economic consultants to examine and measure the actual benefits realized by a city or county from the internal agency use of GIS. The study methodology looked at the cost to perform county agency business functions both with and without GIS. For example, county permit technicians were asked how much time it takes to pull together all the maps and spatial data needed to assist a permit applicant now with GIS, versus the time it would take the technician to perform the same business function without GIS tools and data. The methodology included detailed interviews of 30 key county staff and then an online survey to county GIS users that was completed by 175 respondents. Interview and survey responses were analyzed to compare both with-GIS and without-GIS level of effort. The results were then compiled and monetized by output type and agency to measure cost savings and productivity benefits. The total cost for King County GIS, including capital development, central GIS operations and maintenance, and agency GIS end-user costs from 1992 to 2010 is over $201 million. In 2010 alone these county GIS costs were $14.6 million, but for the same year the Zerbe report measured benefits from GIS of $180 million, with a lower estimate of $87 million. So the benefits over a single year far outweigh the costs for the year, and if repeated for 2011 and 2012, the benefits realized over just two years could eclipse the costs of the previous twenty. This project was partly funded by the Oregon Department of Administrative Services, Geospatial Enterprise Office. Dr. Richard O. Zerbe, Jr. is the Daniel J. Evans Professor of Public Affairs at the University of Washington, where he is Director of the Center for Benefit-Cost Analysis. The King County GIS Center is a part of King County Information Technology, chartered as an internal service fund to provide GIS services to county agencies and external customers. The King County GIS Center operates King County’s enterprise GIS and provides data, services, and training to help put GIS to work. (www.kingcounty.gov/gis). For more information, contact Greg Babinski at the King County GIS Center (206-263-3753; greg.babinski@kingcounty.gov). The King County GIS Center (KCGISC), which is a part of King County’s Department of Information technology (KCIT) is co-located with the Department of Natural Resources and Parks (DNRP) in Pioneer Square’s King Street Center. Prior to the establishment of KCIT as a department in 2011, the KCGIS Center was a part of DNRP. Despite the organizational shift from DNRP to KCIT, the KCGIS Center will continue to provide GIS staff to support the business needs of all of DNRP’s divisions. Many of these support activities are highlighted in the recently released DNRP 2011 annual report, Environmental Stewardship in King County. The annual report’s two-page snapshot of the services that the KCGIS Center delivers to DNRP also provides an overview of the broader KCGIS Center mission to provide efficient, high-quality geographic information system solutions to King County agencies, the public, and regional partners. 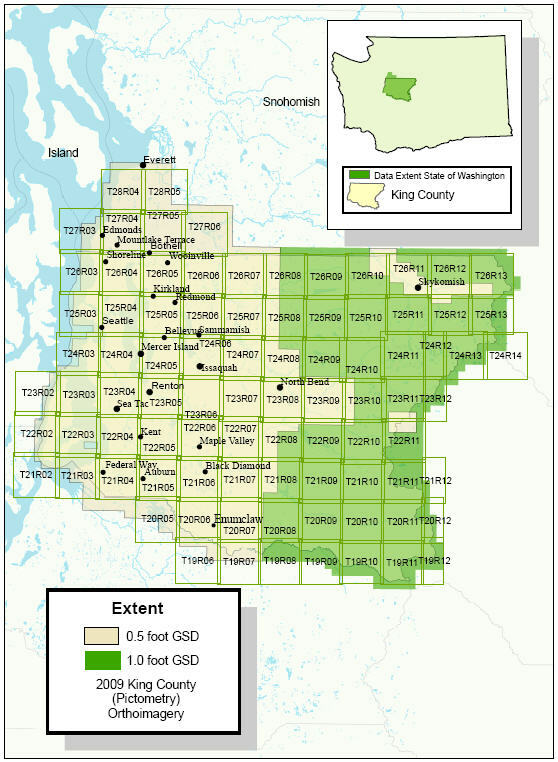 With its Enterprise Operations and Client Services groups, in addition to the staff who are matrixed to the work programs of DNRP and other King County departments, the KCGIS Center truly helps put GIS to work. The King County GIS Center is pleased to announce the addition of 2009 color aerial photos to all iMAP map sets. This set of aerial images was captured from April through October of 2009 by Pictometry (external link). Image resolution for western King and southwestern Snohomish counties, the Snoqualmie Pass area, and most of the US Highway 2 corridor in northeast King County is six inches per pixel. Images for the remainder of King County have one-foot-per-pixel resolution. On Jan. 8, 2002, the newly formed King County Geographic Information System (KCGIS) Center welcomed its first 13 students to a certified GIS training class. This month, just shy of its 10th birthday, the KCGIS Center hosted its 145th class—the latest opportunity for King County employees, as well as staff from numerous other agencies and jurisdictions, to get cost-effective training from leaders in the field of GIS. To date, more than 1,260 students have attended classes at the KCGIS Center. In fact, more than half of the students taught over the years have been clients from outside King County government, including nearly three dozen cities, 14 utilities, 13 state agencies, 12 other counties, and 12 tribal governments, as well as private companies and citizens.“While we developed our in-house GIS training program primarily to provide cost-effective software training for King County employees, we knew that making our classes available to a broader population would help promote the effective use of GIS across the region,” said George Horning, KCGIS Center Manager. During the past decade, the KCGIS Center has generated nearly $760,000 in revenue from its Esri®-authorized classes. Esri is the leading developer of GIS software and geodatabase management applications. While the KCGIS training program is financially self-sufficient, the cost to its students is so low that compared to the cost of taking the training directly from Esri, which is typically offered only in Olympia, King County agencies alone have saved more than $255,000. In the same way, regional customers have saved $308,000. Additionally, the KCGIS training facility can be rented for other forms of GIS training, and rental revenue has generated more than $83,000 for King County since 2004. A wide range of classes and other GIS training events will be offered again in 2012 through the KCGIS Training Program. For information about upcoming opportunities, including a catalog of classes and workshops, a training calendar, prices, and registration details, visit www.kingcounty.gov/gis/training. Training is just one aspect of the King County Geographic Information System. KCGIS is also the engine that powers the web mapping that is available on the King County website, including Parcel Viewer, the heavily used application that gives citizens access to detailed information about real property in the county, and My Commute which displays live road alerts in an interactive map viewer. For information about KCGIS activities and resources ranging from GIS data to application development, client services, and much more, see www.kingcounty.gov/gis.